Let’s say you’re working from home regularly, isolated from all human contact, slowly turning into Jack Nicholson’s character in “The Shining.” So you decide to gain some social interaction and head to a coffee shop, where the table to your right is a group of new moms bragging over whose infant sleeps through the night … and to your left is a scrubby college student blaring music through her headphones. What is a mobile worker to do? According to Telework Research Network, more than 2.8 million people (not including the self-employed or unpaid volunteers) consider their home their primary place of work, but not even half of those 2.8 million consider their home a place where they can get productive work done. So how do we solve this conundrum? If you have immersed yourself in the design world, I am sure you have heard of coworking. Being a current student, I had heard of this concept and new-age design trend last semester when we studied the concept of Hoteling; however, I had not dived deep into the ideas behind the increasing hit. With the simple idea that independent professionals and those with workplace flexibility work better together than they do alone, coworking is flourishing in many cities across the world. I want to work in a Coworking facility! Most offer free coffee, snacks, and Wi-Fi amongst amenities — plus, they just look amazing. The two cities with the largest and most popular coworking facilities around were New York City and San Francisco. Naturally, New York City is an extremely popular place for coworking. (Check out Loosecubes’ Anthony Marinos’ article in this issue, for example). 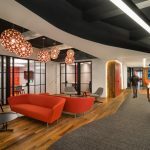 For the young professional who sees himself featured in FastCompany by the time he’s 30, one of the most popular coworking spots is Sunshine Suites with the tagline “Where start-ups grow up.” Sunshine Suites is a community-based shared office space with two locations in Manhattan. Another interesting coworking facility in New York is called The Change you Want to See, a cafÃƒÆ’ ©-like community and collaboration space for developers, writers, and independents — clearly a cultural producer-type facility. It is more than a place to rent — it is a home base and a place for you to come together to not only work, but to live. I believe coworking is a brilliant idea focused on enabling those without a dedicated office to have their own personal touchdown space … and to develop relationships and have “water-cooler” moments with actual human beings rather than with their cats only. Culturally, it’s far more significant. 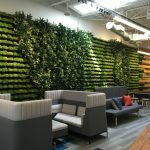 Coworking is rehabbing the need for individuals to feel a sense of connection, collaboration, and inspiration — without requiring millions of dollars and long-term leases, necessarily. Almost all of these spaces offer a “free day” of use. So when I make those big-bucks and can hop a plane to San Fran, I will be the first one to try out Citizen Space. Then I can give you a first-hand account.